As many homeowners know, foundation wall cracks are all too common. At first, many foundation cracks seem relatively small and harmless, but as a crack grows and spreads, it also increases the possibility of having major foundation problems down the road. A lot of foundation wall cracks are the result of shrinkage after a basement is poured or movement of the foundation as the result of soil erosion or shrinking. Regardless of the cause of a foundation wall crack, a wall crack will leave your home open to water seepage and structural deficiencies. Due to this, it’s extremely important that the crack is filled and sealed as soon as possible with foundation crack repair. 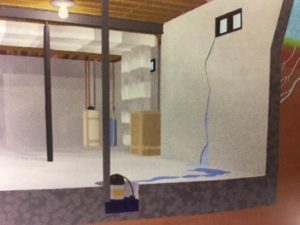 When doing foundation crack repairs, many homeowners are faced with the choice: High pressure or low pressure injection. At Foundation Solutions 360, we’re here to make the choice easy for you. 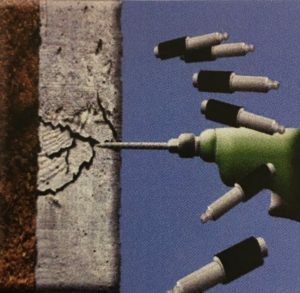 High pressure injection is extremely complex, requires double the number of holes to be drilled, and because the resin is injected so fast, it usually fails to fill the entire void, leaving your wall susceptible to future cracking. On the other hand, low pressure injection is much more precise and thorough because the technician is able to better monitor the injection throughout the slower process. Also, because the injection is much slower, liquid resin will go deeper into the crack, ensuring that your foundation crack is completely filled. 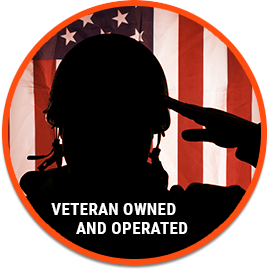 Using a low pressure injection process helps us guarantee a repair that will last throughout the years. Using high pressure injection requires the contractor to drill ports on both sides of the already unstable wall. This leads to further cracking in the process. High pressure injections fail to fill all voids since the resin is injected so fast that it takes the path of least resistance. This also results in the crack only filling in half the wall depth. 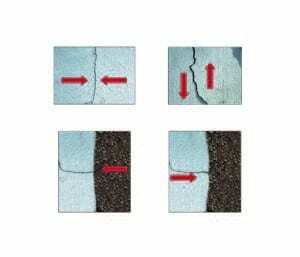 If a crack is structural, the filling material must be as strong as or stronger than the concrete around it. For structural cracks, we recommend using epoxy. When a crack is non-structural, the repair only needs to prevent water leakage. 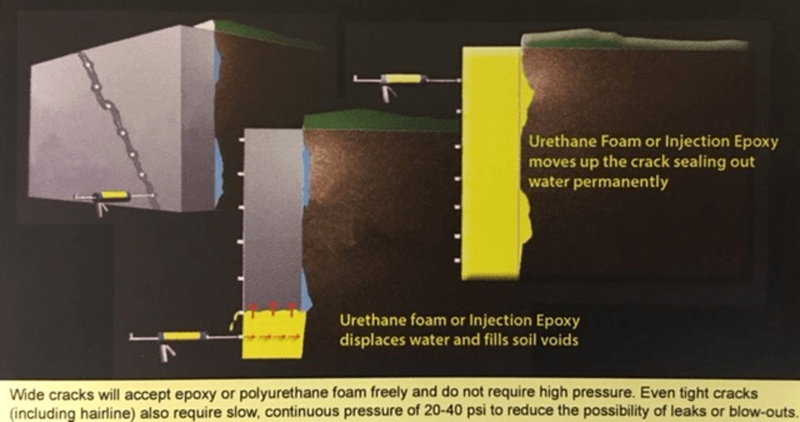 In this situation, many homeowners choose to use polyurethane foam, as it can absorb water as it’s injected and expand up to 30 times its volume. Do you have a foundation wall crack that needs repair? Contact Foundation Solutions 360 today!